Your Mummy's Mask adventure continues! You've barely started exploring the tombs of Wati when the dead begin to rise across the city. You'll need to calm the panic in the streets before you can cross swords with the cultists behind the undead uprising. 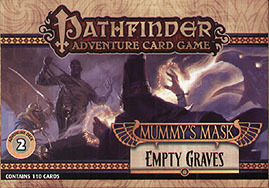 The Pathfinder Adventure Card Game: Empty Graves Adventure Deck is a 110-card expansion that adds 5 new scenarios to the Pathfinder Adventure Card Game, and also includes new locations, villains, monsters, scourges, traders, loot, and more.